This is original udder cream that started it all. The Skin Milk Udder Cream is the lightest of our creams. It easily soaks in with skin repair ingredients and is non-greasy. Milk Protein is added to help keep the skin supple and elastic. MooGoo’s Skin Milk Udder Cream is used in a number of hospitals in Australia as a moisturiser cream for dry and damaged skin following radiation treatment and chemotherapy. You can choose either a 120ml flexible tube and 270g pump bottle. We list all our ingredients on our website below, not only the prettiest sounding ones. Aqua (H2O's Fancy Name), Prunus Amygdalus Dulcis (Sweet Almond) Oil, Olea Europaea (Olive) Fruit Oil, Aloe Barbadensis Leaf Juice (Aloe Vera), Cetearyl Alcohol (Plant Based Emulsifying Wax), Streaic Acid (Thickener), Oryza Sativa (Rice) Bran Oil, Tocopherol (Natural Vitamin E), Piroctone Olamine (Olamine Salt), Polysorbate 60 (Food Grade Emulsifier), Allantoin (Comfrey Root)Extract, P Anisic Acid (Natural Preservative), Coco Caprylate (Coconut-Based Conditioner), Guar Hydroxypropyltrimonium Chloride (Guar Gum), Hydrolysed Milk Protein (For Skin Elasticity), Fragrance (Phthalate-Free Oatmeal), Humulus Lupulus (Hops) Extract. Prunus Amygdalus Dulcis (Sweet Almond) Oil Sweet Almond Oil is extracted from almond kernels. It’s high in minerals and vitamins, and the types of fatty acids needed for troubled skin. Olea Europaea (Olive) Fruit Oil Olive oil is derived from the ripe olive fruit. It’s packed with antioxidants and has a balanced fatty acid composition which restores moisture and nourishment to compromised skin. Olive oil is a great addition to natural and edible skincare. Aloe Barbadensis Leaf Juice (Aloe Vera) Aloe Vera is a flowering succulent plant that stores water in enlarged fleshy leaves, stems, or roots. The leaf juice contains many minerals vital to the growth process and healthy function of all the body's systems, and particularly known for its healing and soothing benefits (including skin and oral health!). Cetearyl Alcohol (Plant Based Emulsifying Wax) Cetearyl alcohol is a Plant-Based Emulsifying Wax emulsified, stabilised and produced from the reduction of plant oils and natural waxes. It’s used for combining oil and water. Streaic Acid (Thickener) Streaic Acid is a fatty wax that holds all of the oils and water together. Without it, our cream would fall apart. It is also very softening on the skin. Oryza Sativa (Rice) Bran Oil Rice Bran Oil is extracted from the outer layer of rice. Rich in anti-oxidants, it is also a skin protectant, rich in gamma-oryzanol helping to replenish your skin. Rice Bran Oil can be an effective substitute for lanolin and can help soothe discomfort. It's a wonderful oil for itchy "alligator" skin. Piroctone Olamine (Olamine Salt) Piroctone Olamine is an organic compound. It is a non-irritating anti-yeast ingredient which helps keep the cream free from bacteria and mould . Polysorbate 60 (Food Grade Emulsifier) A lot of our customers are small. So small in fact that they have sometimes mistaken the creams their mums or dad’s put on the nappy change table for food. So we always choose the most edible ingredients we can. Polysorbates are used in a lot of foods like Mayonnaise, Ice-cream etc to hold the cream and water together. We use them to help with the same thing. Allantoin (Comfrey Root Extract) Comfrey Root has long been associated with soft, healthy skin. Allantoin is a skin conditioner that has been purified from comfrey. A soothing and non-irritating ingredient, Allantoin is thought to help maintain healthy skin by encouraging the removal of dead skin cells and stimulate the growth of healthy skin tissue. P Anisic Acid (Natural Preservative) This Anise derived preservative system from the basil plant is antimicrobial and skin softening. Coco-Caprylate (Coconut Based Conditioner) Coco Caprylate is a coconut based emollient. The coconut oil derived ingredient gives the skin a smooth finish. It is a natural alternative to the silicones used in many creams and hair products. Guar Hydroxypropyltrimonium Chloride (Guar Gum) Guar gum is obtained by dehusking and milling guar seeds. Guar gum acts as a natural preservative, thickener and emulsifier. It also helps make the skin nice and smooth after using our creams. Hydrolysed Milk Protein (For Skin Elasticity) Hydrolysed Milk Protein is one of the most nutrient rich proteins due to its complete amino acid content. Studies have found that milk protein in a cream increased skin elasticity by around 20% compared to the same cream without. Skin elasticity ensures lines and wrinkles are minimised after any movement of the skin. For people with Lactose intolerance this is no problem, however for people that are allergic to Milk Protein itself, this ingredient would not be suitable. Fragrance (Phthalate-Free Oatmeal) We used to use various Essential Oils in our products. EO’s are great if we could talk to each customer and check for allergies. Due to the occasional reaction to EO’s, we removed them. We want to soothe people's skin and scalps, so even a very small number of reactions to EO’s were a problem. But people still want their products to smell nice. So we worked with another company to develop phthalate free fragrant oil (phthalates are the things in fragrances that a lot of people don’t like) and since then the response has been great. Humulus Lupulus (Hops) Extract Skin Care needs to stay pure from yeast and mould. That is why ingredients like Parabens etc are used by a lot of companies. These work great at achieving their aim, but a lot of our “customers”prefer products without parabens. We worked for over a year to develop a preservation system based on Hops Extract. All our creams have now been checked for preservative efficacy using the British Pharmacopeia test. We are very proud that we are probably one of the first companies to develop this natural and edible anti-bacterial system into our creams. A colleague of mine introduced me to your products about 2 months ago, having been so impressed with the results herself, just before I was about to start . Having been warned by all the medical professionals that my skin would react really badly, particularly given I have such fair and sensitive skin.....I was keen to give your products a try. I bought everything! Well not quite everything....udder cream (3 tubes), milky wash, face cream, shampoo and conditioner and started using all your products about a week before my treatment started. I have just finished the five weeks of treatment, applying the udder cream 3 times a day on the treatment area....and the result....everyone (including myself) is amazed by how fantastic my skin looks. No blistering, cracking or excessive redness at all. So thank you Moo Goo....you definitely have me as a customer for life....and I am looking forward to working my way through trying your products....and spreading the word! I only hope anyone about to go through this treatment gets to hear about your products like I did. For the last 18 months I've had Seborrhoeic Dermatitis around my nose which came up out of nowhere & was treating it with an olive oil cream product, but to no avail. I then came across your skin milk udder cream . I've been treating the same issue along my hairline with a hairdressing salon brand of anti-dandruff shampoo, but found it was just aggravating the situation. So yesterday I purchased your milk shampoo and cream conditioner to assist the itchiness, flakiness and redness, I washed my hair the moment I got home. Just from the shampoo alone my hair was squeaking with cleanliness and the cream conditioner was so softening, my hair feels so light, soft and it looks incredibly shiny. , already the redness and flakiness around my hairline has settled right down. Thankyou, thankyou, thankyou. So while loading up your shampoo & conditioner, I thought I'd add your deodorant, milk wash and buttermilk soap as well. I also used each of those products last night and this morning. The milk wash has left my skin feeling so soft and supple, the buttermilk soap smells divine and the deodorant works. I did a boxing class last night and not a whiff of body odor, I half expected to be a bit smelly for the first couple of weeks of using the deodorant but wasn't and am incredibly impressed. 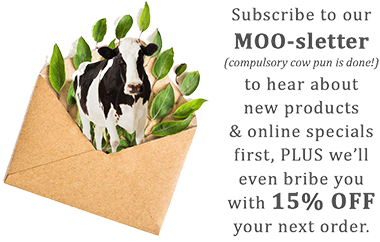 I can't wait to increase my Moo Goo range, next on the list is the rosehip oil and the anti-ageing face cream. I adore your packaging as well, very cute indeed. Thanks Moo Goo for changing my life in such a natural way. I cannot thank you enough, my package has just arrived and you have been more than generous and you have been so very helpful with my delivery issues. The little soft toy cow you included is going to make a very sick little girl a happy one, so thank you. I should have thought to buy one myself as she is an animal & soft toy lover. With a big week of both chemo & radiation coming up hopefully these little gifts will give her something to smile about. There was no need to include the extra products that you did, as I said you have been more than generous but I am so pleased you did! I am really looking forward to using both the cream & balm I ordered for myself as I suffer from psoriasis, keratosis pilaris and basically just all round dry awful skin. Once again thank you so much for your generosity and wonderful customer service. Just wanted to write and say I am officially ADDICTED to your udder creams. I ordered the skim milk first, but loved it too much, so went off to a health food store which stocks your stuff and bought the full cream and anti-aging varieties. Now my skim milk travels with me everywhere, and I am continuously applying it to my hands, face and legs just to keep the scent on me, and the full cream stays at home to be applied liberally after every shower. I'm 23, and don't need an anti-aging product, but it's just a great face cream, and I use it as an eye cream too. I just CANNOT rave enough. I'm seriously a customer for life, so I really hope you guys will be around forever! Thanks so much for the awesome products, will continue using them forever. Having endured years of cryotherapy on my face and have been using moogoo udder cream twice daily i can not believe the texture and appearance of my skin and friends keep asking me what am i doing to look so well thank you for a great product and looking forward to using pots and pots of udder cream i find it most effective as i perspire very heavily and for whatever reason the cream disappears and doesnt clog my skin thanks again.